I am Creating one VB.NET Windows application.In this Application I am going to explain about Select, Insert, Update and delete Operation in VB.Net and MySQL. Here I am displaying Records in Datagridview from MySQL Database. I am Creating windows application in vb.net named Myproject. 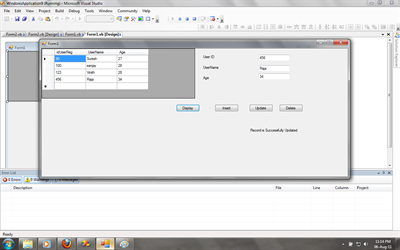 In this application I am using Three Textbox, Datagridview, Four Button controls and Four Labels. txtUserid.Text: It is used to get the user id from users. txtUserName.Text : It is used to get the user name from users. txtAge.Text : It is used to get the age of the users from users. DisplayRecords : if you click the DisplayRecords button, the user details will display in DataGridview. AddRecords : if you click the AddRecords button, the user details will store in data base table. UpdateRecords : if you click the UpdateRecords button,the user details will update from data base table. DeleteRecords : if you click the DeleteRecords button, the user details will delete from data base table. DataGridview1 is used to display user details. If you want to Connect VB.Net with MySQL Data base, You Should use MySql.Data.MySqlClient Namespace. It Contains MySQL Connection class and Methods. MySqlConnection :it is used connect VB.NEt with MySQL Data Base. MySqlDataAdapter :it is acting as bridge between MySQL and VB.Net. MySqlConnection Class is used to connect to MySQL database. Insert Records in MySql Database. 'Query = "INSERT INTO  userreg"
Query = "INSERT INTO userreg(idUserReg,UserName, Age)VALUES("
Query = Query + txtUserRegId.Text + ",'" + txtUserName.Text + "'," + txtAge.Text + ")"
lblMsg.Text = "Record is Successfully Inserted"
lblMsg.Text = "Record is not Inserted"
Update Records from MySQL Database. Query = "UPDATE userreg SET UserName ='" + txtUserName.Text + "',"
lblMsg.Text = "Record is Successfully Updated"
lblMsg.Text = "Record is not Updated"
lblMsg.Text = "Record is Successfully Deleted"
lblMsg.Text = "Record is not Deleted"
Here I am creating table in MySQL Data base with Following Fields. The Table Name is userreg. Thanks for spending your valuable time.if you have any doubts or any Suggestion , Let Me know. I am Happy to update here. i have error it said Fill : SelectCommand.Connection property has not been initialized. Please check the Data base connection whether you are giving correct or not. Errore	2	L'espressione è un valore, quindi non può essere la destinazione di un'assegnazione. Query = "INSERT INTO clienti(nome)VALUES("
Query = Query() + TextBox1.Text + ")"
I want to do something tricky. I hope you could help me. I have a database with self given id's. So, if I delete a record from the middle , for example I have id's like 1,2,3,4,5... and if I delete a record with id 3, records from 4 and 5 should shift up. so 4 becomes 3 and 5 becomes 4. Is it possible in vb.net ? Don't use Query(). Use Query . it is a string variable not method. Query = Query + TextBox1.Text + ")"
"+" Operator is concatenation in C# programming language. Here I am using "+" Operator for concatenate the query. Query = "INSERT INTO userreg(idUserReg,UserName, Age)VALUES(" + txtUserRegId.Text + ",'" + txtUserName.Text + "'," + txtAge.Text + ")"
but it is lengthy query. that's why I am using "+" Operator. I think now you get my point. How to Create a New Database(in MySQL) through VB.Net??? I have a error in MySqlConnection, MySqlCommand, MySqlDataAdapter do i need something to declare? why is the HTML part not shown?? show the HTML part with asp:buttons/textboxes, and how is the HTML code part written as well? show the whole HTML code that goes with this please! if i have more than 3 textbox what i should do?